This Dadao style sword is constructed using one solid piece of tempered 1075 high carbon steel. Fully functional and weld-free, this sword comes with a sharp, hand honed edge. The guard features lashing holes and there is a metal ring at the bottom of the handle. Hardwood handle scales are secured using brass pins for a grip that will last. 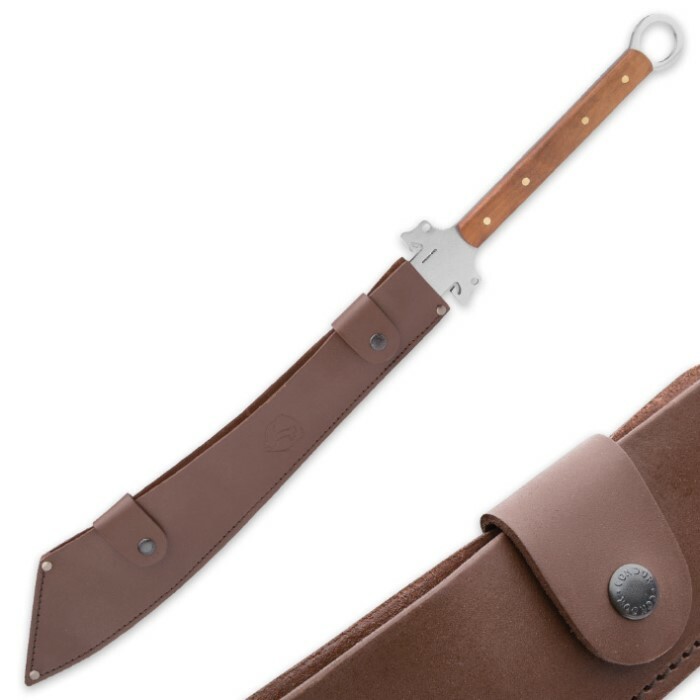 A genuine leather sheath is included. 21 1/4 in. blade, 32 in. overall. I've had one of these baddies for years now, and i gotta say, for the price, there is literally nothing tougher. If you go around wildly swinging at trees, do expect some dulling of the blade. I have chopped through nails in hunks of wood, and that is what it took to finally get any kind of nick on the heavy blade. Even after some damage, the tough steel and heavy blade make it as capable as any axe to just keep hacking away. If you want a sword to fool around with with reckless abandon, you're in the right place. This is the real deal and will break most of the Shiniwa sword in half of make them non- functional. This sword has some heft to it and when sharpened to a high degree is an awesome weapon in the hands of someone that can use it. I bought two of theses a while back when they first came out to hang on my wall. I then found out they are real, not just wall hangers. You can chop logs like a machete with these and the blades are fine. If you are someone who likes to beat on your swords you can have fun with these. They are a heavy chuck of carbon steel that is built tough enough to hack trees down. Received my Condor Dadao today via UPS. As always, Trueswords got the order out and to my door quickly, the package was very well done (outer box with padding on either end over the original factory box, etc. Now for the sword. Wow. Just wow. This is one amazing sword. Absolutely full tang (LOL...no question at all with this sword), beautiful 1075 high carbon steel, nice looking hardwood handle, blade nicely tapers, and a leather sheath that is one serious piece of well done leather work. Really, pictures don't do this sword justice...it looks much better in person. Blade came perfectly sharp for this type of blade where you don't want too sharp a blade (for fear of rolling it when doing serious cutting, etc.). Speaking of cutting, I blew my son's mind cutting with it. Dual cardboard boxes it came with? Absolutely no problem. The real test was the giant (is it gallon sized) Arizona Ice Tea bottle filled with water. Those bottles are tough plastic, and my son's Cold Steel sabre can't come close to cutting through one of these bottles. One cut, without too much effort I might add, and I split that Arizona Ice Tea bottle clean in half! Water sprayed everywhere (including all over me), and the blade made a sound that had me worried for a second it had split/cracked in some way. After thorough inspection, though, the blade was totally fine...no damage at all. 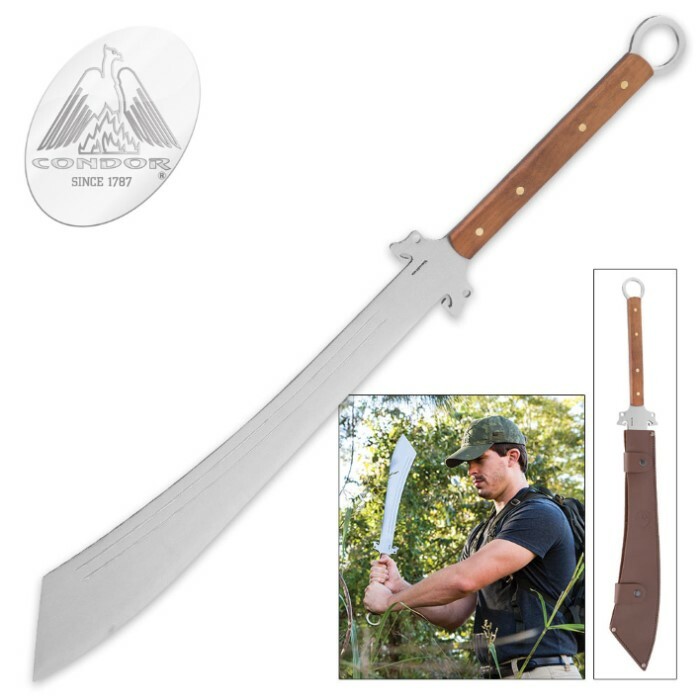 Despite being a true sword (and not a machete at all...this is built, apart from the guard, like a classic Chinese dadao, I could see using this not just for practice cutting but to chop down a tree if you ever needed to. I don't think anything could truly hurt this blade. I am absolutely head over heels in love with this sword, but if I could I'd give it a 4.5 simply because the handle is too flat/thin for my tastes. I'll be wrapping it - either with paracord in a traditional Chinese wrap or in leather like Hanwei did with their Military Dadao (which is no longer produced). All in all...you cannot go wrong with this sword. Get it, you won't regret it. Totally awesome sword!! Overbuilt and rugged, should be a great user! No need to hang this one on the wall and just look at it!! This two handed Dadao sword made by Condor is awesome! It cuts through saplings, palm trees, brush and even cactus with ease. The weight of this Chinese designed El Salvadorian made blade isn't to bad. In my opinion, this well balanced Condor Dadao is superior to ones made by Cold Steel, Paul Chen and the ones that were made in India a few years back. Just remember that it's made from quality 1075 high carbon steel and must be stored or kept with a small bit of oil on the metal. For the price, It is well worth it! First off, as always Trueswords got it to my door in a heartbeat. Shipping is always ALWAYS top notch. Second, I'm slightly disappointed because I expected something a hellova lot larger than what I got. Though it feels solid, one huge slab of steel with the wood handle, feels nicely balanced and all just... tiny. I should of went ahead and got the Cold Steel Greatsword over this. So I'm somewhere in between glad I bought it, and wishing I had bought another. Curse me for rushing through it cause I saw it was back in stock. Hint to how awesome this blade is......its always sold out!!!!! i bought 2, took one out took a big kendo vertical chop sank in to a tree stump like an axe.....then i did it again.. and again.. and i think again again again and again, other than a bunch of zombie tree blood the blade was untouched. braided some para cord on the handle now its perfect. better than i expected for the prce. well worth the money for a functional sword. recomend anyone you will not be dissapointed.